Free beauty samples alert! Take your brows from now to wow! 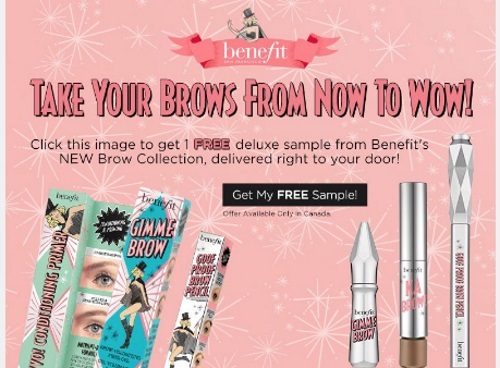 Sign up to get Free Benefit Cosmetics samples from their new Brow Collection! Sign up and give your friend a free deluxe sample! They will be sent a link to sign up in their email! The following products are available: KaBrow Deluxe Sample Light/Medium (1.0 g), Gimme Brow Deluxe Sample Light/Medium (1.0 g), and Goof Proof Pencil Deluxe Sample Light/Medium/Dark (11 g). Offer available while quantities last. Team up with a friend to get one! Limit of one per household. Product selected at random. Shade preferences while quantities last. This sample is estimated to ship out on August 24th, 2016 and will arrive in approximately 2-3 weeks.